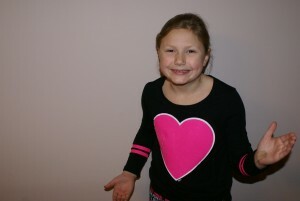 Here is a great Valentine Tutorial! 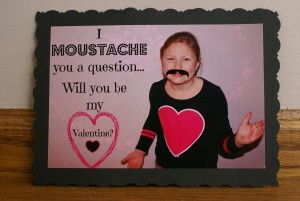 This year I decided it would be cute to do a “moustache” themed Valentine for my 8 year old daughter. I had her put on a cute shirt with a big pink heart on it…had her pose and took her picture. 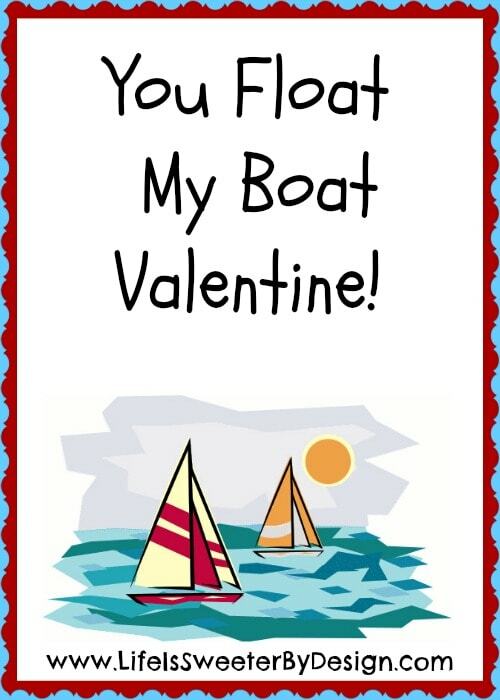 Then I used Picmonkey to edit the photo and personalize it for the Valentine. 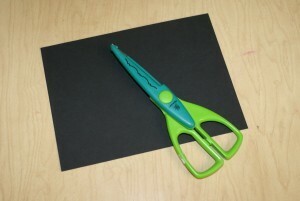 Then I mounted the photo onto some cardstock that I trimmed up with some decorative scissors. Last I attached some “real” fake moustaches as a gift for each child that gets a Valentine! 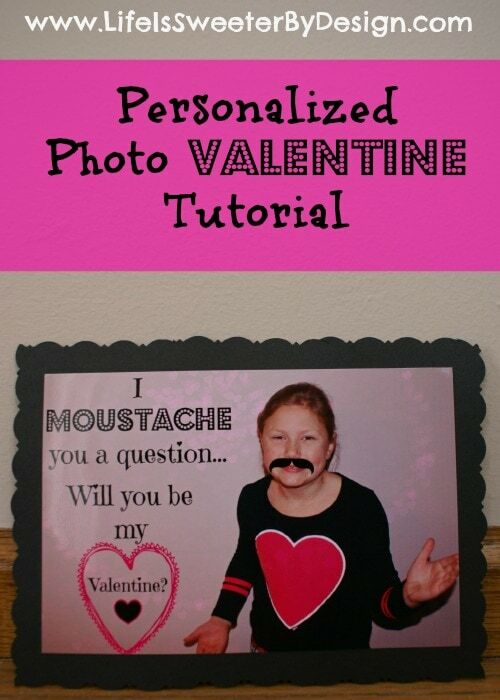 My daughter thought this personalized Valentine tutorial was really cute….she thinks the picture of her with the moustache is hilarious! 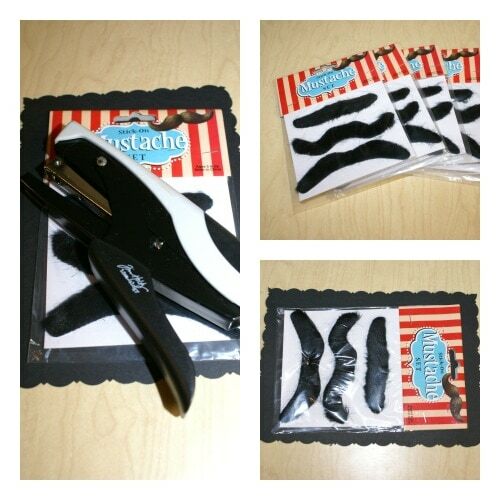 She also knows the kids in her class will love getting the fake moustaches to wear. 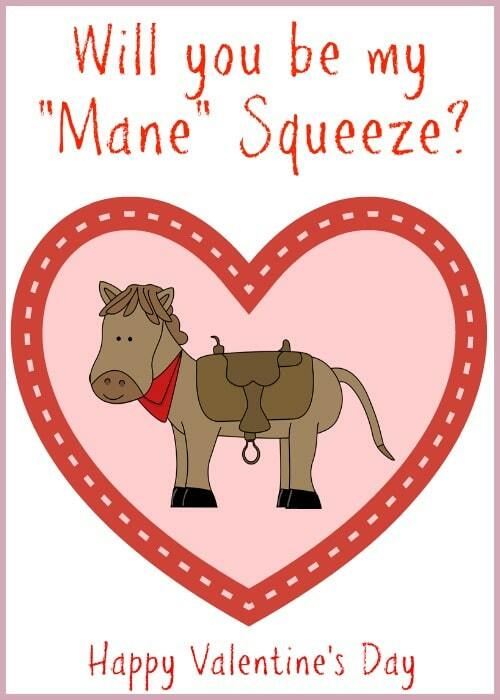 I thought others may want to try out a Personalized Photo Valentine for their children. 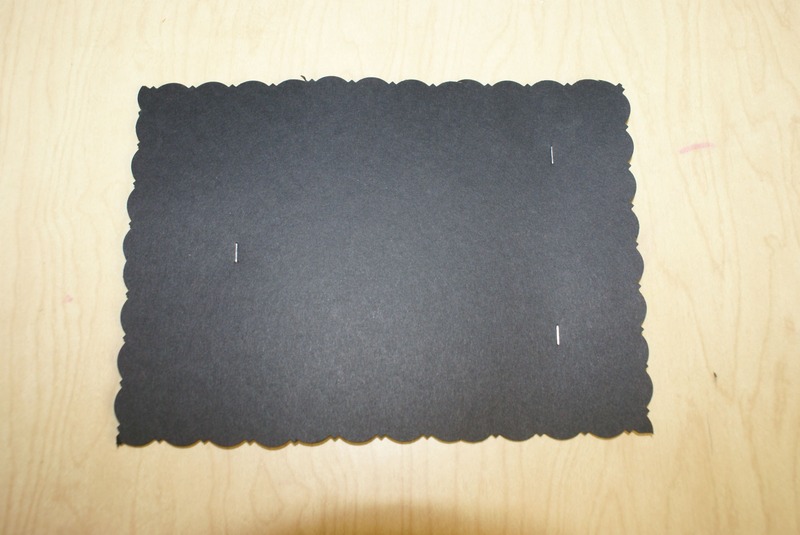 Here is a tutorial of how I made this valentine. 2. Next you will want to go to www.picmonkey.com and click on EDIT and upload your picture to Picmonkey. This is a screenshot of how it will look in Picmonkey. 3. 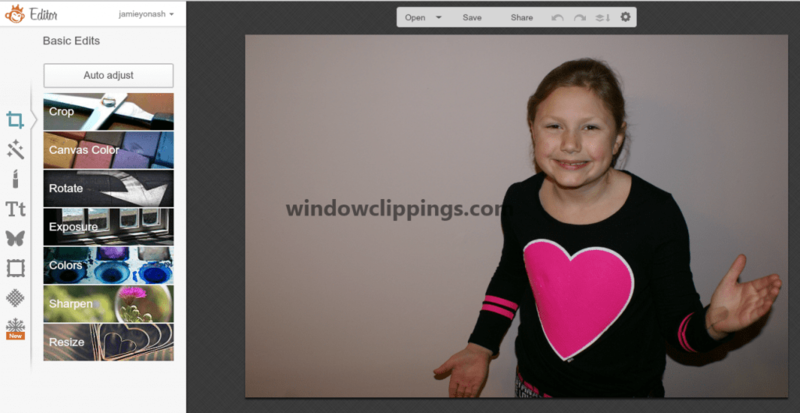 If you need to crop your picture that will be your next step. You will see a box labeled “crop” on the left hand side of the screen. Click on this box and you will be able to crop your image to your liking. 4. Next you will click on the butterfly along the left hand side. This is for overlays. Scroll down in the overlay category until you see one for “facial hair”. Open that overlay category. You can choose which moustache you would like your child to have! 🙂 You will simply click on the one you want and that will put it onto your picture. Use your mouse to move it around and you can resize it with the white box that is around the graphic. Place the moustache where you want it and just click off of it to keep it in place. If you want to move it later just click on the graphic and it will bring the white box back up. 6. Now you will type your text into the box that is now on your photo. The Text box that came up allows you to choose font size colors, etc. So you can play around with it however you want. You can move the text box around also. I used 2 different fonts. I typed what I wanted to say and then highlighted the word “moustache” and while it was highlighted I clicked the other font I wanted and it switched to that font. 7. I wanted to put the word “Valentine” inside a heart…to make it a little cuter. So before I typed the word “Valentine” I put my heart graphic on the photo. If you want to use a heart or other graphic…you will go back over and click on the butterfly on the left hand side. Go to the category Doodly Hearts and click on it to show your heart options. Choose the one you like and click on it to put it on your photo. Now you can change the size, color, etc. 9. I felt like the inside of the heart looked a little bare, so I added another small heart graphic. I went back into the overlays (butterfly) and this time I chose a Doily Heart because I wanted a 2 color contrast. The Doily Hearts are only available with the paid Picmonkey membership. If you are working on the free version then you will need to chose a graphic that isn't in the “royale” section. Just place your heart inside the bigger heart and resize it to look good and change the colors if you want. In the box on the left under Bokah Hearts….you will see a blue paint brush. This brush will let you get rid of the hearts in places you don't want them. When you click on the blue paintbrush, a little white circle will show up as your cursor. Just move the circle to where you don't want the hearts and hold down the right clicker while you “erase” the hearts from that area. It is very easy to do! Once you are happy with it, click APPLY. 11. Now you are done with the photo editing portion! You will click on the Save button on the top middle bar and save the picture to your computer. Then you can print it off at home or have the pictures printed off somewhere else…my favorite place is Shutterfly! 12. 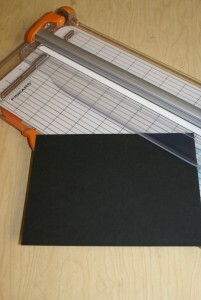 Now I just took some black cardstock and cut it down with my Fiskars SureCut LED Rotary Trimmer so that it was a little bit bigger than my photo. I cut it about 8.5 inches by 6.5 inches. 13. 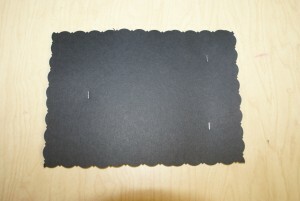 I used some decorative edge craft scissors to make a pretty border. You could also use different paper punches. 15. I used some scrapbooking adhesive to adhere the photo to the cardstock and Voila..an adorable and personalized photo valentine! I hope you enjoyed this Valentine tutorial. Please let me know if you have any questions or if you decide to make this. I would love to see a picture of your finished product! Your little girl is awesome! I love Picmonkey! I’ve had the paid version for a long time and it’s the perfect photo editor for me. Such a creative idea! I love this idea and how you made it yourself! This is soo cute! Thanks for sharing! This is such a great craft to do with the kiddos. I truly love the personalization of the card which I think makes it more special for the recipient. BTW: PicMonkey rocks! This is too cute! You did a great job! Thanks! It is really easy!